The team was founded in 1959 as the Titans of New York, an original member of the American Football League (AFL); later, the franchise joined the NFL in the AFL–NFL merger in 1970. The team began to play in 1960 at the Polo Grounds. 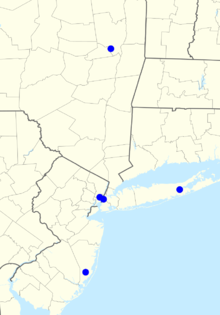 Under new ownership, the current name was adopted in 1963 and the franchise moved to Shea Stadium in 1964 and then to the Meadowlands Sports Complex in 1984. The Jets advanced to the playoffs for the first time in 1968 and went on to compete in Super Bowl III where they defeated the Baltimore Colts, becoming the first AFL team to defeat an NFL club in an AFL–NFL World Championship Game. Since 1968, the Jets have appeared in the playoffs 13 times, and in the AFC Championship Game four times, most recently losing to the Pittsburgh Steelers in 2010. However, the Jets have never returned to the Super Bowl, making them one of three NFL teams to win their lone Super Bowl appearance, along with the New Orleans Saints and Tampa Bay Buccaneers. Apart from the Cleveland Browns and Detroit Lions, who have never reached the Super Bowl (although both won NFL championships prior to 1966), the Jets' drought is the longest among current NFL franchises. The first organizational meeting of the American Football League took place on August 14, 1959. Harry Wismer, representing the city of New York at the meeting, proclaimed the state was ready for another professional football team and that he was more than capable of running the daily operations. Joe Namath quarterbacking for the Jets in Super Bowl III. Hess lured then-disgruntled New England Patriots head coach Bill Parcells to New York in 1997. Parcells led the team back to relevance and coached them to the AFC Championship Game in 1998. Hess died in 1999 while the team, plagued by injuries, produced an eight win record, falling short of a playoff berth. At the end of the season, Parcells stepped down as head coach deferring control to his assistant, Bill Belichick; Belichick resigned the very next day (leaving a napkin at the stage for his introduction, on which he had written "I resign as HC of the NYJ") and went on to accept the head coaching position with the Patriots. The franchise obtained a new owner in Woody Johnson in 2000. Additionally, through the 2000s the Jets visited the playoffs five times, a franchise record, under the direction of three coaches. Rex Ryan was hired in January 2009. Ryan led the team to back-to-back AFC Championship appearances during his first two years but the team never made the playoffs again during his tenure. Harry Wismer, a businessman, had been interested in sports for much of his life when he was granted a charter franchise in the American Football League. A three-sport letterman, football, particularly, stuck with Wismer who went on to play for the University of Florida and Michigan State University before a knee injury ended his playing career. Undeterred, Wismer began his career as a broadcaster originally with Michigan State and became a pioneer of the industry. Later, as the Titans owner, Wismer formulated a league-wide policy which allowed broadcasting rights to be shared equally among the teams. Wismer hoped the Titans could play in what would become known as Shea Stadium beginning in 1961. However, funding difficulties and legal problems delayed construction of the stadium. Wismer signed a memorandum of understanding in late 1961 to secure the Titans' new home. That memorandum recognized that the Mets would have exclusive use of the stadium until they had completed their season. As the team moved to Shea under new ownership, they were, in most years, required to open the season with several road games, a problem made worse in 1969 and 1973 when the Mets had long playoff runs. Although confident they could secure the stadium, their hopes were dashed when Sheldon Silver and Joseph L. Bruno, both of whom held veto power over the stadium construction, refused to support the project, alleging it would hurt rather than help the development of the West Side. The rivalry began to escalate and receive increased media attention in 1997 when a disgruntled Bill Parcells vacated his head coaching position with New England to accept the same position with New York. The following year, the Jets signed Pro Bowl running back Curtis Martin from the Patriots. After the Jets declined during Parcells' third year, Parcells decided to resign as head coach. His assistant, Bill Belichick, resigned suddenly the next day to become the head coach of the Patriots instead. A critical turning point of the rivalry took place on September 23, 2001 when Jets linebacker Mo Lewis tackled Drew Bledsoe, leaving the veteran with internal bleeding. This provided an opportunity for Tom Brady to take over as the starting quarterback and during his tenure, Brady successfully guided New England to six Super Bowl titles. In 2006, Eric Mangini, an assistant under Belichick, left New England to join the Jets as their head coach. Under Mangini, the famous Spygate incident took place, further escalating tensions between both clubs. When Rex Ryan was hired as the team's head coach, the rivalry further escalated due to an increased war of words between both teams. In January 2011, the two met in a Divisional Round playoff game. The visiting Jets pulled a 28–21 upset to advance to the AFC Championship Game, which they ultimately lost one week later to the Pittsburgh Steelers. The Jets and the Bills represent the same state (New York), and this rivalry represents the differences between New York City and Western New York, where the Bills play. The teams are both charter members of the American Football League and have generally stayed in the same division since, even after the NFL and AFL merged. Aside from a few notable moments, such as O. J. Simpson breaking an NFL rushing record against the Jets, a playoff game in 1981, and ex-Jets coach Rex Ryan coaching the Bills for two years, the rivalry has otherwise been characterized by shared mediocrity and uncompetitive games, including notable blunders by quarterbacks Mark Sanchez of the Jets, and J. P. Losman of the Bills. The Jets met the Giants in 1988 during the final game of the regular season. The Jets, with a 7–7–1 record, had little to lose as their hopes for playoff contention had vanished. The Giants, however, were contending for a playoff spot and a victory would have secured their spot and their division title. Although the six point favorites, the Giants were unable to overcome the Jets defense which saw the Jets sack quarterback Phil Simms eight times. With the Jets' victory and victories by the Rams and Eagles, the Giants were eliminated from playoff contention and the Jets gained respect in the eyes of many. In spite of the big sibling rivalry that has resulted in trash talk between the players, both teams have formed an unexpected and consequently strong partnership sharing Giants Stadium for 26 years and MetLife Stadium, a venture in which both teams own a 50% share of the stadium. The rivalry regained much of its tension in the 2011 NFL season when the Jets and Giants met in Week 16. Both teams needed a victory to keep their playoffs hope alive and there was significant trash talk between Rex Ryan and his players and many of the Giants in the weeks leading up to the game. Ryan and Giants running back Brandon Jacobs reportedly came close to blows after the game, a 29–14 win by the Giants. The two teams met again on December 6, 2015, with the Jets coming from behind and winning 23–20 in overtime. The Jets redesigned their uniforms and primary logo for the 2019 season. The new team colors are a medium green that the franchise calls "Gotham Green," white, and black. The primary logo is a green football-shaped oval outlined in white, oriented horizontally, with the word "JETS" in thick, sans-serif italics positioned just below the horizontal axis with "NEW YORK" above it in smaller letters, and a miniature football graphic at bottom center partially covering the lower portion of the "E" and "T". The primary uniform consists of green jerseys with white numerals and white jerseys with green numerals, green and white pants, and green socks. The numerals are in a new sans-serif block-style font and have thin black outlines, with "NEW YORK" in thick sans-serif italics above the numerals on the front, TV numerals on the upper shoulders, and the player's name in sans-serif block letters on the back, in either green or white. The jerseys have opposite-colored stripes around the shoulder that taper toward the collar, and the pants have opposite-colored stripes on each side that taper toward the lower thigh. The team also has a black alternate uniform with white numerals outlined in green, green stripes and black socks. The helmet is a deep metallic emerald green with a black facemask; the decal on each side is a secondary logo, consisting of the primary logo's "JETS" wordmark and football graphic. The Jets unveiled new jerseys and an updated logo for the 2019 season. The jerseys are colored "Gotham Green" for home and "Spotlight White" for away. They also introduce black as a team color for the first time since 1997. The Jets' current flagship radio station is WEPN 98.7 ESPN with Bob Wischusen, as the play-by-play announcer and former Jet Marty Lyons of the Sack Exchange, as the color analyst. Monday Night Football games are televised in a simulcast with ESPN by either sister station WABC-TV, or WPIX-TV if WABC chooses to waive the game to another station to carry regularly scheduled programming. Thursday Night Football carriage of a Jets game is incumbent on the producing network for that game (on FOX), which is also simulcast by NFL Network. Joe Namath, Hall of Famer. His #12 was retired by the Jets. Ewbank, Martin, Maynard, and Namath are recognized based upon their achievements with the Jets. Ewbank is also recognized based upon his achievements with the Baltimore Colts, coaching them to NFL championships in 1958 and 1959. Riggins is recognized primarily for his seasons with the Washington Redskins (1976–1979, 1981–1985), as is Monk (1980–1993), who won three Super Bowl championships with Washington. Lott is in the Hall of Fame primarily for his exploits as a member of the San Francisco 49ers. Baugh and Turner are recognized based upon their achievements as players with other teams, rather than their head coaching stints with the Jets. While Parcells reversed the fortunes of the Jets, he had major impact for the New York Giants, coaching them to two Super Bowl victories. Wolf only had a brief stint with the Jets between 1990 and 1991, while most of his major contributions occurred as an executive and player personnel director with the Oakland Raiders (1963–1974, 1979–1989), and later as General Manager of the Green Bay Packers (1991–2001). Favre only played one season as a member of the Jets in 2008, between most of his career with the Packers (1992–2007) and his last two NFL seasons with the Minnesota Vikings (2009–2010). The Jets established a Ring of Honor on July 20, 2010, to commemorate former players. Each season, players will be nominated by an internal committee and then inducted into the Ring. There is no specific amount of honorees to be selected each year. The Jets have had a history of selecting players who turned out to be draft busts. Perhaps one of the most disappointing players in Jets history was running back Blair Thomas. Thomas, who averaged 5.4 yards per carry at Penn State, was an intriguing prospect the Jets were interested in utilizing to help their cumbersome offense. Confident in their decision, the Jets drafted Thomas with the second overall pick in 1990, expecting him to be a solid player for years to come. Thomas ran for only 620 yards in 1990, and failed to meet the high expectations. By the time Thomas left the team as an unrestricted free agent in 1993, he had rushed for 2,009 yards and only five touchdowns. The 2008 first round pick, defensive lineman Vernon Gholston, followed a similar path, failing to record a sack during his three-year tenure with the team.Kyle Brady in 1995, who was drafted ahead of Warren Sapp, one of many disappointments during Rich Kotite's tenure as coach. However, in the same draft, the Jets did better with Hugh Douglas. Dewayne Robertson was a fourth overall selection in 2003 by the Jets. The defensive tackle out of Kentucky failed to make a big impact with the team. He accounted for 14.5 sacks in his 5 seasons with the team, a rather underwhelming player given what the Jets had hoped for. At quarterback, the Jets found themselves dealing with the consequences of drafting University of Alabama QB Richard Todd in 1976. In his tenure with the Jets, he threw for more interceptions than he did touchdowns. In the '81 season, the Jets played vs the Miami Dolphins in the AFC Championship Game. Todd threw for 5 interceptions and the Jets lost the game. A year later, Todd would be traded to the New Orleans Saints. The most recent bust, Dee Milliner, was drafted by the team in 2013. Milliner played his college career at the University of Alabama and had high expectations after being drafted. Lasting just 3 years with the team, Milliner's career was plagued by injuries and inconsistency, recording only 3 interceptions during his brief Jets career. ^ "Year in Review - 1959". NewYorkJets.com. NFL Enterprises, LLC. Retrieved August 21, 2017. The American Football League's first organizational meeting was held in Chicago under the leadership of Lamar Hunt of Dallas. Charter franchises were granted to New York and Harry Wismer; Dallas, Los Angeles, Minneapolis, Denver and Houston. ^ "General FAQ". NewYorkJets.com. NFL Enterprises, LLC. Retrieved April 5, 2019. ^ a b Bergman, Jeremy (April 4, 2019). "New York Jets unveil new uniforms, green helmets". NFL.com. NFL Enterprises, LLC. Retrieved April 5, 2019. For the first time in over 20 years, the New York Jets will take the field with a new look, to go with their new head coach and high-priced free agents. The Jets unveiled on Thursday evening their new uniforms, helmets and branding for the 2019 season and beyond. Their team colors are "Gotham Green, Spotlight White and Stealth Black." ^ "New York Jets Team Capsule" (PDF). 2018 Official National Football League Record and Fact Book. NFL Enterprises, LLC. August 9, 2018. Retrieved April 5, 2019. ^ "New York Jets, LLC". Bloomberg Businessweek. Archived from the original on April 1, 2011. Retrieved July 26, 2017. ^ a b "Year In Review: 1969". NewYorkJets.com. NFL Enterprises, LLC. Archived from the original on October 31, 2012. Retrieved June 24, 2010. ^ "New York Jets Playoff History". Pro Football Reference. Archived from the original on April 5, 2011. Retrieved April 5, 2011. ^ Lange, Randy (April 16, 2008). "Training Center by the Numbers". NewYorkJets.com. NFL Enterprises, LLC. Archived from the original on April 5, 2011. Retrieved April 5, 2011. ^ "New York Jets Corporate Headquarters and Training Center-Florham Park, N.J". ENR New York. December 2009. Archived from the original on April 5, 2011. Retrieved April 5, 2011. ^ "Jets to Remain in Florham Park for 2015 Training Camp". NewYorkJets.com. March 31, 2015. Retrieved June 29, 2017. ^ a b "Minutes of the First Organizational Meeting of the American Football League" (PDF). Pro Football Hall of Fame. August 14, 1959. Archived from the original (PDF) on January 15, 2011. Retrieved July 23, 2010. ^ "Year In Review: 1962". NewYorkJets.com. NFL Enterprises, LLC. Retrieved July 23, 2010. ^ a b "Year In Review: 1963". NewYorkJets.com. NFL Enterprises, LLC. Retrieved July 23, 2010. ^ "How All 32 NFL Teams Got Their Names". September 10, 2017. ^ Cross, B. Duane (January 22, 2001). "The AFL: A Football Legacy". Sports Illustrated. Archived from the original on March 28, 2011. Retrieved March 28, 2011. ^ "Year In Review: 1997". NewYorkJets.com. NFL Enterprises, LLC. Retrieved June 29, 2010. ^ "Year In Review: 1998". NewYorkJets.com. NFL Enterprises, LLC. Retrieved June 29, 2010. ^ a b "Year In Review: 1999". NewYorkJets.com. NFL Enterprises, LLC. Retrieved June 29, 2010. ^ "Year In Review: 2000". NewYorkJets.com. NFL Enterprises, LLC. Retrieved June 29, 2010. ^ "New York Jets Playoff History". Pro Football Reference. Archived from the original on March 28, 2011. Retrieved March 28, 2011. ^ "Jets welcome Ryan to New York". ESPN. Associated Press. January 22, 2009. Archived from the original on March 9, 2011. Retrieved March 9, 2011. ^ Oehser, John (February 24, 2011). "Rex Ryan Guarantees Super Bowl Title for Jets' Next Season". AOL News. Archived from the original on March 28, 2011. Retrieved March 28, 2011. ^ Gola, Hank (January 12, 2000). "Hess Family Hits Gusher In Jet Sale". New York Daily News. Archived from the original on March 23, 2011. Retrieved March 23, 2011. ^ a b Sandomir, Richard (January 14, 2000). "Sports Business; For Hess's Estate, It's a jets.com". The New York Times. Archived from the original on March 23, 2011. Retrieved March 23, 2011. ^ a b c d e Sandomir, Richard (January 12, 2000). "Man in the News; Philanthropist and Fan". The New York Times. Archived from the original on March 23, 2011. Retrieved March 23, 2011. ^ Wilson, Duff (November 11, 2004). "Behind the Jets, a Private Man Pushes His Dream". The New York Times. Archived from the original on March 23, 2011. Retrieved March 23, 2011. ^ Bishop, Greg (March 27, 2010). "Jets' Woody Johnson Leaps Into the Limelight". The New York Times. Archived from the original on March 23, 2011. Retrieved March 23, 2011. ^ Borger, Julian (January 19, 2017). "New York Jets owner Woody Johnson to be US ambassador to UK". The Guardian. Retrieved November 4, 2017. ^ Slater, Darryl (June 23, 2017). "5 things to know about Christopher Johnson, Woody Johnson's Jets successor". The Guardian. Retrieved November 4, 2017. ^ Eskenazi, Gerald; McGowen, Deane (May 27, 1977). "Court Accord Keeps Football Jets at Shea Stadium". The New York Times. Retrieved November 10, 2010. ^ a b c Brown, Clifton (March 24, 2005). "N.F.L. Owners Vote to Give the Jets a Super Bowl". The New York Times. Archived from the original on March 23, 2011. Retrieved March 23, 2011. ^ Anderson, Dave (May 9, 1999). "Sports of The Times; Hess Mulled The Return Of the Jets". The New York Times. Archived from the original on March 25, 2011. Retrieved March 25, 2011. ^ Chan, Sewell; Charles V. Bagli (April 1, 2005). "Jets Win Stadium Battle by 2 Touchdowns (the Vote Is 14–0)". The New York Times. Archived from the original on March 23, 2011. Retrieved March 23, 2011. ^ a b Bagli, Charles V. (December 23, 2004). "2 Groups Sue to Halt Action on Jets Stadium". The New York Times. Archived from the original on March 23, 2011. Retrieved March 23, 2011. ^ Bagli, Charles V.; Michael Cooper (June 7, 2005). "Olympic Bid Hurt as New York Fails in West Side Stadium Quest". The New York Times. Archived from the original on March 23, 2011. Retrieved March 23, 2011. ^ a b Bagli, Charles V. (September 29, 2005). "Jets and Giants Agree to Share New Stadium". The New York Times. Archived from the original on March 21, 2011. Retrieved March 21, 2011. ^ "New Giants-Jets stadium to cost in range of $1B". ESPN. Associated Press. December 12, 2005. Archived from the original on March 23, 2011. Retrieved March 23, 2011. ^ a b "Owners warm up to New York/New Jersey as Super Bowl XLVIII host". National Football League. Associated Press. 2010. Archived from the original on March 23, 2011. Retrieved March 23, 2011. ^ DeLessio, Joe (April 1, 2010). 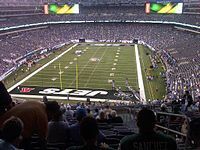 "Jets and Giants to Play in Preseason Meadowlands Stadium Opener". New York Magazine. Archived from the original on November 13, 2010. Retrieved July 19, 2010. ^ Bishop, Greg (September 13, 2010). "In Ugly Debut, Reality Sets in for Jets". The New York Times. Archived from the original on January 25, 2011. Retrieved January 22, 2011. ^ a b c Graham, Tim (September 11, 2008). "Jets-Pats rivalry transcends games". ESPN. Archived from the original on January 17, 2011. Retrieved July 5, 2010. ^ a b c Hale, Mark (January 13, 2011). "Inside the Jets-Patriots rivalry". New York Post. Archived from the original on March 21, 2011. Retrieved March 21, 2011. ^ "Jets' Belichick era lasts one day". ESPN. January 5, 2000. Archived from the original on January 17, 2011. Retrieved June 19, 2010. ^ Battista, Judy (January 28, 2000). "Pro Football; Patriots Hire Belichick, and Everyone's Happy". The New York Times. Archived from the original on January 17, 2011. Retrieved June 19, 2010. ^ Kelly, Mark (January 29, 2008). "Call it the curse of Mo Lewis". ESPN. Archived from the original on January 17, 2011. Retrieved June 19, 2010. ^ Mortensen, Chris (September 11, 2007). "Sources: Camera confiscated after claims of Pats spying on Jets". ESPN. Archived from the original on January 17, 2011. Retrieved June 19, 2010. ^ Florio, Mike (August 23, 2010). "Rex Ryan: I don't like Tom Brady; he knows we hate the Patriots". Pro Football Talk. Archived from the original on January 17, 2011. Retrieved January 17, 2011. ^ "Buffalo Bills hire Rex Ryan as head coach". NFL.com. ^ "Did Rex and Bills get last word on Bowles' Jets? F— yeah". Sporting News. November 13, 2015. ^ "Sanchez's INTs overshadow Jones' career day as Jets lose third straight". October 19, 2009. ^ "Jets escape costly defeat after scoring on late turnover". NFL.com. Retrieved September 7, 2015. ^ Eskenazi, Gerald (November 28, 1994). "Pro Football; The Spike Was a Fake, but the Damage to Jets' Season Is Real". The New York Times. Archived from the original on January 17, 2011. Retrieved June 28, 2010. ^ a b Diegnan, Mike (December 4, 2002). "MNF's Greatest Games: Miami-New York Jets 2000". ESPN. Archived from the original on March 21, 2011. Retrieved March 21, 2011. ^ Graham, Tim (February 1, 2010). "Jets' Ryan calls incident 'stupid'". ESPN. Archived from the original on January 17, 2011. Retrieved June 19, 2010. ^ a b Cimini, Rich (February 1, 2011). "Sal Alosi resigns from Jets job". ESPN. Archived from the original on February 2, 2011. Retrieved February 2, 2011. ^ a b c d e Branch, John (October 7, 2007). "A Rivalry That Everyone Has Forgotten to Remember". The New York Times. Archived from the original on January 17, 2011. Retrieved July 25, 2010. ^ a b c d Litsky, Frank (December 18, 1988). "Pro Football; Giants Go for the Title". The New York Times. Archived from the original on March 21, 2011. Retrieved March 21, 2011. ^ a b Eskenazi, Gerald (December 19, 1988). "Jets stagger Giants and Rams knock them out; Lyons helps Jet defense win Respect". The New York Times. Archived from the original on March 21, 2011. Retrieved March 21, 2011. ^ Litsky, Frank (December 19, 1988). "Jets stagger Giants and Rams knock them out; Errors crucial in 27–21 Defeat". The New York Times. Archived from the original on March 21, 2011. Retrieved March 21, 2011. ^ Rhoden, William C. (August 15, 2010). "It's a Battle for the Soul of New ... Stadium". The New York Times. Archived from the original on March 21, 2011. Retrieved March 21, 2011. ^ Perlman, William (December 24, 2011). "Jacobs, giddy Giants not done chewing the fat with Jets". US Presswire. The National Football League. ^ "Introducing the Next Generation of Jets Football". NewYorkJets.com. NFL Enterprises, LLC. April 4, 2019. Retrieved April 5, 2019. ^ Shorenstein, Marissa (October 22, 2006). "Wave Hello to New Flag Carriers". NewYorkJets.com. NFL Enterprises, LLC. Archived from the original on October 15, 2010. Retrieved March 15, 2011. ^ "Jets' Flight Crew Set for Takeoff". New York Daily News. August 8, 2007. Archived from the original on October 15, 2010. Retrieved October 15, 2010. ^ "NY Jets Junior Flight Crew Cheerleader General Information". NewYorkJets.com. NFL Enterprises, LLC. January 27, 2010. Archived from the original on October 15, 2010. Retrieved March 15, 2011. ^ Allen, Eric (February 13, 2008). "Wischusen Still Having a Blast as Voice of the Jets". NewYorkJets.com. NFL Enterprises, LLC. Archived from the original on March 17, 2011. Retrieved July 22, 2010. ^ "Bob Wischusen". MSG. Archived from the original on March 17, 2011. Retrieved July 14, 2010. ^ "Ian Eagle". CBS Sports. Archived from the original on March 17, 2011. Retrieved July 14, 2010. ^ "About SportsNet New York". SportsNet New York. Archived from the original on March 17, 2011. Retrieved July 21, 2010. ^ "Ronnie Lott". Pro Football Hall of Fame. Archived from the original on April 9, 2011. Retrieved April 9, 2011. ^ "Sammy Baugh". Pro Football Hall of Fame. Retrieved August 9, 2015. ^ "Bulldog Turner". Pro Football Hall of Fame. Retrieved August 9, 2015. ^ "Bill Parcells". Pro Football Hall of Fame. Archived from the original on June 4, 2013. Retrieved June 3, 2013. ^ "Ron Wolf". Pro Football Hall of Fame. Retrieved August 9, 2015. ^ a b "Jets Unveil Ring of Honor, Class of 2010". NewYorkJets.com. NFL Enterprises, LLC. July 20, 2010. Archived from the original on January 17, 2011. Retrieved July 20, 2010. ^ "All-Time AFL Team – Offense". Pro Football Hall of Fame. Archived from the original on January 17, 2011. Retrieved July 14, 2010. ^ "All-Time AFL Team – Offense (Second Team)". Pro Football Hall of Fame. Archived from the original on January 17, 2011. Retrieved July 14, 2010. ^ "All-Time AFL Team – Defense". Pro Football Hall of Fame. Archived from the original on January 17, 2011. Retrieved July 14, 2010. ^ "All-Time AFL Team – Defense (Second Team)". Pro Football Hall of Fame. Archived from the original on January 17, 2011. Retrieved July 14, 2010. ^ "Year In Review: 2003". NewYorkJets.com. NFL Enterprises, LLC. Retrieved July 9, 2010. ^ Cimini, Rich (March 2, 2011). "Jets cut Vernon Gholston, Ben Hartsock". ESPN. Archived from the original on March 2, 2011. Retrieved March 2, 2011. ^ Wesseling, Chris. "Sheldon Richardson wins Defensive Rookie of the Year". National Football League. Retrieved January 9, 2015. ^ Lange, Randy. "Wilkerson, Richardson at the Forefront in '14". New York Jets. Retrieved January 9, 2015. Chastain, Bill (2010). 100 Things Jets Fans Should Know & Do Before They Die. Chicago: Triumph Books. ISBN 978-1-60078-522-1. Eskenazi, Gerald (1998). Gang Green: An Irreverent Look Behind the Scenes at Thirty-Eight (Well, Thirty-Seven) Seasons of New York Jets Football Futility. New York: Simon and Schuster. ISBN 0-684-84115-0. Lange, Randy (2005). Stadium Stories: New York Jets. Guilford, Connecticut: The Globe Pequot Press. ISBN 0-7627-3783-2. Ryczek, William J. (2009). Crash of the Titans: The Early Years of the New York Jets and the AFL (revised ed.). Jefferson, North Carolina: McFarland & Co. ISBN 978-0-7864-4126-6. Sahadi, Lou (1969). The Long Pass: The Inside Story of the New York Jets from the Terrible Titans to Broadway Joe Namath and the Championship of 1968. New York: The World Publishing Company. ISBN 978-1-58567-933-1. Strother, Sidney (1988). NFL Top 40: The Greatest Pro Football Games Ever Played. New York: Viking. ISBN 0-670-82490-9. Wikimedia Commons has media related to New York Jets.